Printers Printing Printers ….. The Printers the limit baby! Printers printing printers. A concept that my friends and I have long toyed with. So in saying that….Welcome to the future where the creation reigns and your only limit to what you can construct would be your printer and your materials. Instead of going out and buying your friend, child, or whoever some present, people all over the world are being offered the opportunity to simply create again. The prototype 3D printer under development by Artur Tchoukanov and Joris Peels allows people to design figurines and shapes on a computer (possibly the future YOUR PHONE! ), and then print them (IN PLASTIC) and out to play with. We must ask ourselves what kind of worldwide implications are at hand when your children can start to make their own toys and adults can start to be more self sufficient in the printing of nails or other tools, maybe even houses.. Instead let us stand up in and chant HUZZAH in the idea that you don’t have to buy things for your children any more (other than a printer which of course could print other printing printers) As Arthur Tchoukanov would say…. Let them make their own! Origo’s concept video is very basic, but it gives you a good idea of what Tchoukanov and Peels hope to accomplish. A computerized interface allows whoever to digitally construct and design a shape, and then the printer creates it in an hour (+). A machine that takes your thoughts and transfigures them into material objects to be understood by those who only operate in the 5 sense realm..fun for the entire family? “Origo is still in the prototype phase, but its creators have openly discussed some of the ultimate specs on their Twitter feed and Facebook page, as well as on their main site. We should expect the 3D printer to have a USB port, wireless connectivity, a price around $800, and it will use 3Dtin as its design software. $40 to $400 a kilo for plastic! However it seems as though with time the company will try to find a lower price, however presently they aren’t able to say exactly how. Probably one of the most exciting aspects of this printer (other than the fact that you are creating and designing things from the ground up…) would be its recyclable nature. The “recycling pod” Origo is coming up with would be able to break down old objects and of course be used in the printing of new objects. Look for yours soon, because I know that I will be printing printers to print more printers printing printers and have the last one print out nanobots that repair all my other printing printers really, really soon. 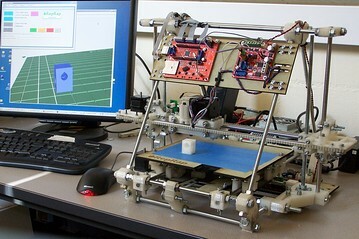 In fact on the UK side of things To orient ourselves towards the direction of global context we should also examine the UK side of things Dr. Adrian Bowyer, from the Department of Mechanical Engineering at the University of Bath has actually created a 3d printer that will print other 3d printers all for the price of less than £500. Below is an image of the ReRap (Bowyer’s product). The idea is that 3d printing works like the current printers we use however, instead of dispensing ink to a page it layers different materials such as plastic alloy which in time will become a solid object. The raw material for the printer is a cheap plastic, typically from recycled material. Dr. Bowyer said a 1Kg drum cost about £30. This idea is one that will have a holistic effect worldwide. Wherever these exist a creative outlet exists. The modern consciousness worldwide is one of disease due to seeing people as simply resoureces and a loss of creativity on our basic level. Let’s hope that this allows us to begin again creating and sharing as people were meant to. This entry was posted in About these cultures:, Culture and tagged creativity, Origio, plastic, plastic alloy, ReRap, UK.